In the aftermath of recent comments by Neil Young, in which he criticized the low fidelity of compressed digital music, Apple has introduced a new encoding process for audio engineers which the company says will provide "for higher fidelity sound on your computer, stereo, and mobile devices". 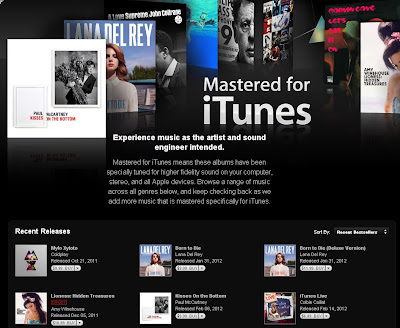 By following the higher-resolution encoding process, music producers can earn earn the label "Mastered for iTunes" in the iTunes store. "dynamic range that’s superior to red book audio and a final product that’s virtually indistinguishable from the original recording"
Though Apple is providing engineers with a set of tools (for the Mac) to use high-resolution digital masters, which are typically sampled at 92KHz or 192KHz with 24b resolution, the company is not upgrading the resolution of the format they are using to distribute "Mastered for iTunes" content. It is the same variable bit rate (VBR) 256Kbps AAC encoding format which the company introduced in 2007. Uncompressed 16b CD audio requires a bit rate of 705.6Kbps, at the 44.1KHz sampling rate. The first step in Apple's process is for engineers to utilize a Sample Rate Conversion (SRC) to re-sample the master file to a sampling rate of 44.1KHz, storing the output in a 32-bit floating-point file. Apple claims that this can preserve all of the dynamic range of a 24-bit source file. Nevertheless, in the Technology Brief, Apple reminds engineers that you will "encode your masters precisely the same way the iTunes Store does". Engineers are generally familiar with the maxim: "Garbage In - Garbage Out". With the new "Mastered for iTunes" process, Apple is at least encouraging higher quality input, even if the output format remains the same as it has been for the last five years. It remains to be seen if Apple will develop Neil Young's dream of a portable music player that can utilize uncompressed 192/24 audio files. Improving the sound of your digital music - earbuds are not your friends. Improving the sound of your digital music - Part II: Setting the reference baseline.